Another Pneumonia Vaccine for Seniors: What's the evidence on Prevnar13? In September 2014, the Centers for Disease Control and Prevention (CDC) issued a new guideline1 recommending the administration of Prevnar13, a type of pneumonia vaccines, to adults 65 years and older. This is to be given in addition to Pneumovax23, the pneumonia vaccine that adults 65 years and older already receive based on prior guidelines. All good questions. Let’s look closely at the guidelines to see if we can answer these questions. What is the difference between Pneumovax23 and Prevnar13? Pneumovax23 stands for pneumococcal polysaccharide vaccine (23-valent). First used in 1945, it was an important landmark in medical history. Pneumovax23 was the first pneumonia vaccine, and the first to be made from capsular polysaccharide, which can help induce immunity in host body. It is called 23-valent because it aims to protect against 23 types of pneumococcal capsules, which translates to 50-80% efficacy2. Prevnar13 stands for pneumococcal conjugate vaccine (13-valent). It is made from bacterial cell membrane sugars conjugated with a diphtheria toxin protein called CRM197 to induce a stronger immune response. It is traditionally given to children and adults over 19 years old with certain medical conditions (lack of spleen, compromised immune system, etc.) It is called 13-valent because it aims to protect against 13 types of pneumococcal capsules, 12 of which were exactly the same as the ones covered by Pneumovax23. The only serotype covered by Prevnar13, but not by Pneumovax23, is serotype 6A. Why would we want to add Prevnar13 to Pneumovax23, which adults 65 and older were already getting? It turns out that a percentage of severe illness in older adults is caused by the types of pneumococcal bacteria that Prevnar13 can protect against. For example, 20-25% of a disease entity called invasive pneumococcal disease (such as meningitis, bacteremia) is caused by bacterial serotypes that Prevnar13 covers1. It should be noted that even though Pneumovax23 covers these similar serotypes, it is stipulated that Prevnar13 will be more effective, because its conjugated protein should induce a stronger immune response than Pneumovax23. 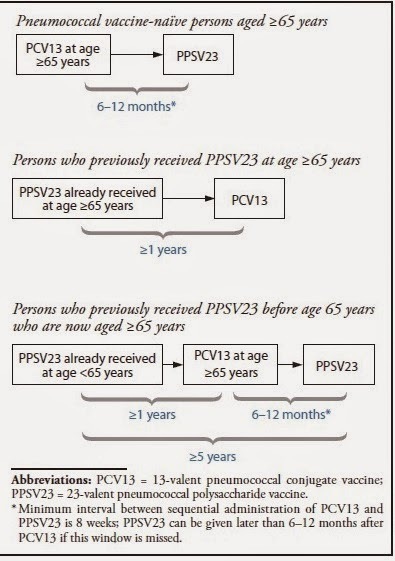 Since many adults 65 years and older may have already received Pneumovax23 based on prior guidelines, it cannot be undone or replaced by Prevnar13. The only policy option for these adults would be to add Prevnar13 to the pre-existing vaccine schedule. And we might as well – Prevnar13 should be compared to the status quo, a kind of non-inferiority trial. If it is not better than what we were doing, then why do it? What kind of evidence was used to back up the new guidelines? The guidelines stemmed mostly from a large trial conducted by Pfizer, the manufacturer of Prevnar 13. Called the CAPiTA trial3, this study was the first to measure important patient-centered outcomes related to pneumonia vaccines, such as the incidence of pneumonia or invasive pneumococcal diseases among older adults. All prior studies only measured titers, the amount of immune response generated by vaccines, but it is unclear what measured titers mean in real life, how it translates to the number of pneumonia cases prevented, the number of pneumonia-related deaths averted, etc. The CAPiTA trial looked at 84,496 adults 65 and older who had not received any pneumonia vaccines of any kind (neither Pneumovax23 or Prevnar13). It then randomized these patients to either getting Prevnar13 or placebo. The study reported the overall efficacy of Prevnar13 against the bacterial serotypes it was designed to cover (if patients were infected with bacterial serotypes not covered by Prevnar13, these cases of failure were not counted towards the efficacy calculation). According to the CAPiTA trial, the overall efficacy of Prevnar13 was 45.6% against overall pneumonia, 45.0% against non-bacteremic pneumonia and 75.0% against invasive pneumococcal disease. On the surface, these results appear significant. But, comparing Prevnar13 against getting no vaccine is not a fair fight. A better comparison would evaluate 2 groups of patients: those who only received Pneumovax23 (status quo) vs those who received both Pneumovax23 and Prevnar13. The CDC included a cost-effectiveness analysis4 of adding Prevnar13 compared to status quo, but no actual research study was conducted to see how the analysis holds up in the real world. In addition, the results of the CAPiTA trial were only reported as part of a research abstract – these results have not been published in any peer-review medical journals, and the validity of the trial cannot be evaluated. What is the best sequence of administration of the two vaccines? Another study included in the guideline attempted to determine the sequence of pneumonia vaccine administration: should we give Prevnar13 or Pneumovax23 first? The study5 randomized 720 adults between the age of 60 to 64 years old (excluding the population for which the recommendations are made) into 2 groups: the group receiving Prevnar13 followed by Pneumovax23 vs the group receiving Pneumovax23 followed by Prevnar13 (the reverse). The study found that giving Prevnar13 first followed by Pneumovax23 is the best way to go – it produces a higher titer than the other way around. However, the study found that adding Prevnar13 after Pneumovax23 produced lower titers than giving Pneumovax23 alone (status quo). The mechanism is unclear, but it seems that giving Pneumovax23 followed by Prevnar13 resulted in a dampened immune response. Based on this finding, it is unclear why the CDC would recommend adding Prevnar13 in adults 65 and older who have already received Pneumovax23 based on prior guidelines, which is likely the majority of adults 65 and older currently living in the US. At a closer look, the guidelines appear to be based on a trial of Prevnar13 conducted by its manufacturer with possible conflict of interest, based on unpublished data, studies measuring immune titers with unclear benefits to patients, a mathematical calculation that was not tested in the real world, a study to determine vaccine sequence that excluded the target population (adults 65 years and older), and the possibility that giving Prevnar13 to patients who already received Pneumovax23 might actually be worse than not giving it. Given the lack of clear evidence, physicians should evaluate the new CDC guidelines with caution. Back to Mr. R: I couldn’t give him a good reason why he should get Prevnar13, so I let him be. So far, no pneumonia yet. By Dr. June Howell, a geriatric fellow at Icahn School of Medicine at Mount Sinai who blogs at Medium and tweets @junehowellmd. 1. CDC. Use of 13-Valent Pneumococcal Conjugate Vaccine and 23-Valent Pneumococcal Polysaccharide Vaccine Among Adults Aged ≥65 Years: Recommendations of the Advisory Committee on Immunization Practices (ACIP). MMWR 2014; 63(37);822-825. 2. Centers for Disease Control and Prevention (CDC); Advisory Committee on Immunization Practices. Updated recommendations for prevention of invasive pneumococcal disease among adults using the 23-valent pneumococcal polysaccharide vaccine (PPSV23). MMWR Morb Mortal Wkly Rep. 2010;59(34):1102-1106. 3. Bonten M, Bolkenbaas M, Huijts S, et al. Community Acquired Pneumonia Immunization Trial in Adults (CAPiTA). Abstract no. 0541. Pneumonia 2014;3:95. Available at https://pneumonia.org.au/public/journals/22/PublicFolder/ABSTRACTBOOKMASTERforwebupdated20-3-14.pdf. 4. Stoecker C. Incremental cost-effectiveness of modifying PPSV and PCV recommendations for adults age 50 and over. Presented at the Advisory Committee on Immunization Practices June 25, 2014 meeting, Atlanta, GA; 2014. Available at http://www.cdc.gov/vaccines/acip/meetings/downloads/slides-2014-06/pcv13-02-stoecker.pdf. 5. Greenberg RN, Gurtman A, Frenck RW, et al. Sequential administration of 13-valent pneumococcal conjugate vaccine and 23-valent pneumococcal polysaccharide vaccine in pneumococcal vaccine–naïve adults 60–64 years of age. Vaccine 2014;32:2364–74. Beware that the incidence of adverse reactions to the 2nd vaccine really increases to about 30-40% per package insert. After inability to move my right arm for several weeks from the 2nd vaccine I was concerned. But it is one of the adverse reactions listed. About a month later, I had a patient who had the same painful reaction with inability to move the entire arm in the same arm as the 2nd vaccine. I reported to Merk. Received a call back and was told the incidence of adverse reactions frin 2nd vaccine actually is more like 62% . They have not gotten back to me on incidence of inability to move the arm.